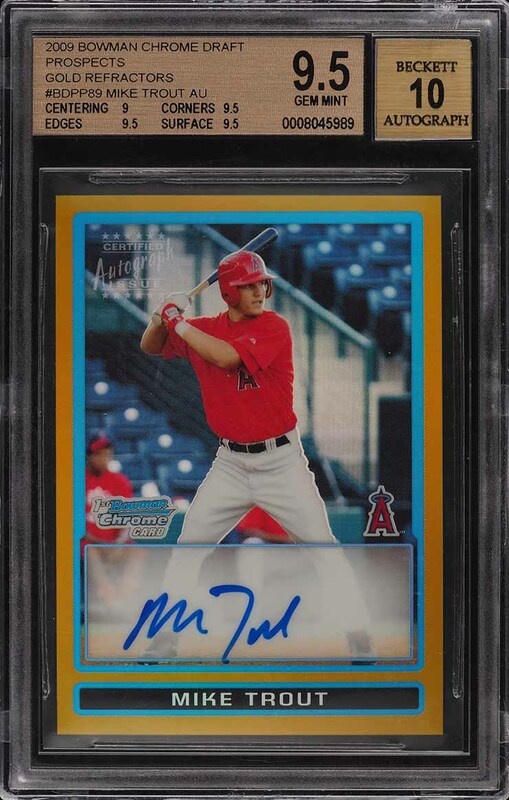 Among the holy grail of Mike Trout rookie cards! On the market this month is perhaps Mike Trout's most desired and beautiful rookie card, the '09 Bowman Chrome Gold Refractor. 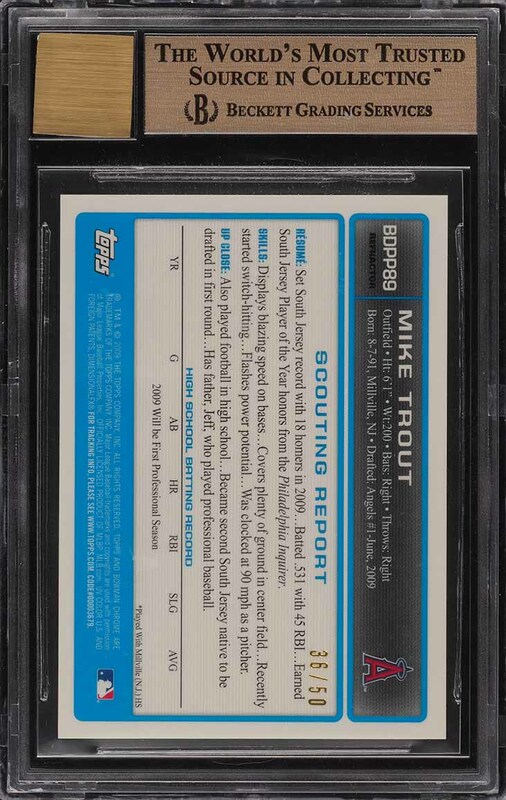 This card is visually appealing to even the most novice of investors with its sensational gold borders surrounding a highly talented, young Mike Trout. The offered base '9.5' boasts four untouched corners with beautiful chip free edges around. The surfaces are virtually immaculate with zero refractor lines, scuffs or indents present. An extremely modest centering shift is all that accounts for the '9' sub-grade. On top of these highly sought after card qualities, the autograph is undeniably pristine and beautifully struck in blue ink. With a limited production run of just fifty and far fewer having reached the illustrious designation, it's easy for us to state that the demand for this card in such condition far exceeds supply. There are few players in the game with as bright a future as Mike Trout. Since entering the MLB he has dominated in every facet of the game and continues to put up near Triple Crown numbers each season. Mike Trout just signed a record $430 Million contract extension with the Angels and it's considered by most experts to be a steal. All told, this is certainly the most important modern Baseball card we've auctioned in recent years, but perhaps more intriguing is the future ROI of this Fine Art equivalent investment piece as the entire trading card market continues to mature. Comes highly recommended by PWCC. Enjoy! One of nearly 15,000 cards, lots, and sets up for bid in our 4th Auction of 2019. Click on the link above to view the other PWCC auction lots. The PWCC Vault is now live! Open a PWCC Vault account and receive a custom Vault shipping address. Purchases shipped to the Vault receive free shipping and reflect Oregon's 0% sales tax rate.